Helpful Information | Teaneck Junior Soccer League, Inc.
TJSL aims to provide every child on a team, a fun and safe experience, to improve their confidence and skills at soccer, and at being part of a team and a league composed of friends and neighbors. From the TJSL website, you can access the Team Roster & Game/Practice Schedules. From the Teams menu, click on Choose a Team>, select the current Season, Division and your child's Team. Team Page: You can see the upcoming Schedule of games, practices & training sessions. To see the complete Schedule for the season, click on Full. Roster: from the Teams menu, click on Roster to see the team Coaches & members. This menu option is not displayed until a team is selected. Schedule: from the Teams menu, click on Schedule to see the complete Schedule. When on the Schedule page, click on Options (right side of the screen) & select Calendar Feed. On the next screen, pick the appropriate option (Google or Outlook) & follow instructions. Scroll down to see instructions on how to get the smartphone app. Review & abide by the Parents Code of Conduct. Help the coaches teach your kids to behave respectfully towards coaches, referees and to one another. Watch games & practices from the designated spectator areas. Parents are not allowed in the player area during games. Let your coach know if your child will miss a game, practice or training session. Encourage your child to his or her best at whatever position is assigned by the coach. Come to practices and games on time with a good attitude, properly dressed and with the right equipment. Players must wear shin guards, fully covered by socks. Soccer cleats are optional, sneakers are permitted. 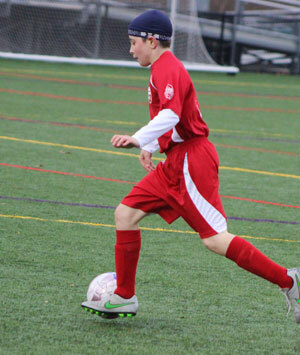 When playing on the new turf fields, soccer cleats are the preferred choice. However, baseball, football or softball cleats are not allowed. For reasons of safety, no earrings or jewelry is allowed, including metal clips, pins or beads in the hair. Bring a bottle of water labeled with the player’s name - ONLY WATER IS ALLOWED ON THE TURF FIELDS. Stay connected, with the Teaneck Soccer smartphone app. From the iTunes or Android store, search for SI Play or League Athletics, and download the mobile app. Enter your password or use the Magic Link feature. You will receive in your email a link that you have to open from your mobile. Once you log in, your team(s) will be shown automatically. In the app, you can see your Roster, Schedule and send RSVPs for team activities. If you already had the app installed, log out & log back in to see your new team(s). Open the app and enter your TeaneckSoccer username (email), Click on Search and select TeaneckSoccer as the organization. Enter your password, enable Notifications (to get reminders of games & practices) and click on Save. Select the Team name (grouped by Division). To change the team, select Teams from the menu and then a team name.